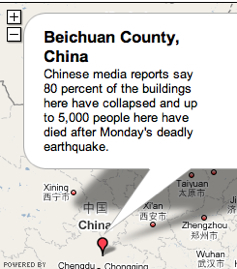 Earthquake in China. I am been shooting up some prayers but thought a blog post would be in order. I found out about the earthquake through Twitter. So did a lot of other people. One blog reports that Twitter has now come of age. Once again, if you know worthy groups to donate to, or local communities who can help, please leave a comment or link. If you know worthy groups to donate to, or local communities who can help, please leave a comment or link. It will be intersting to see what kind of social entrepreneurism comes out of this. and how many Non profit organizations come out of the woodwork to help people in China.